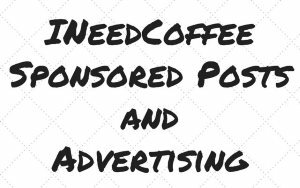 In this article you will learn how to make your own hand-designed coffee wrapping paper, to make your great gift ideas even better. 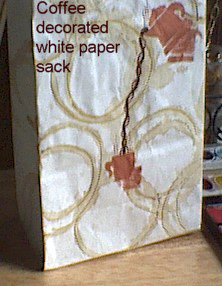 Gently pull apart the paper bag and flatten, or cut craft paper to size desired. Lay centered on a flat surface. Drip coffee over paper, allowing it to splash/splatter. Do not rinse, drain or otherwise remove puddles of coffee. This ensures that your splash patterns will dry distinctly. 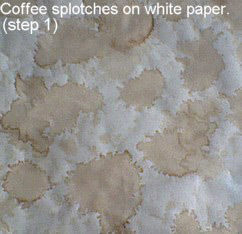 When dry, if you want more splashes, repeat process, dripping more coffee onto paper and allowing to dry. 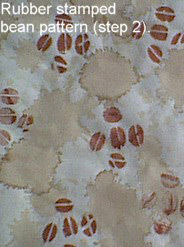 Once satisfied with pattern, spread paint in pan or dip brush in paint. Press rubber stamp into paint or coat with paint from brush and begin to apply pattern to paper. Allow to dry. A second color can be used in same stamp pattern or a different stamp. 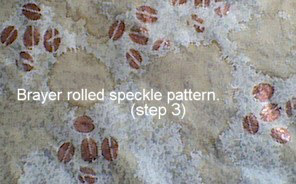 Decorate with speckles from paint flicked from brush or decorative brayer-rolled pattern. Stamp in spaces between your coffee splotches. Load stamp with paint and start in center of your paper with first stamping. 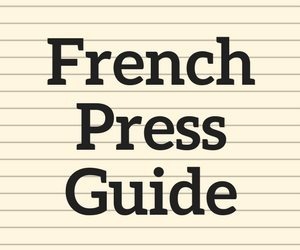 Stamp a second or third time moving outward to the sides of the paper, making a lighter impression as you move outward. Stamping a balanced but semi-random pattern is easier. Finish your project with a third process, such as paint splatters flicked on from a brush, rolled on with a decorative brayer, or highlight areas of your pattern with a gel metallic pen. To do this: dip a mug into coffee and press onto sack, making coffee rings. 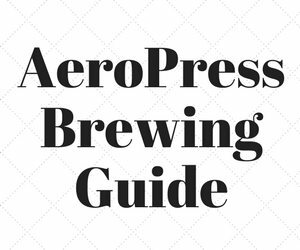 Apply coffeepot and mug using rubber stamps. Draw first coffee stream using brown marker. 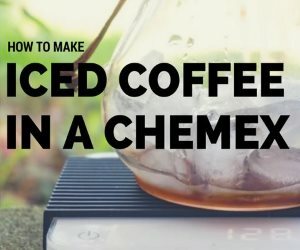 Draw second coffee steam with glue and sprinkle with coffee grounds. Draw circles over selected coffee rings with metallic gel marker. 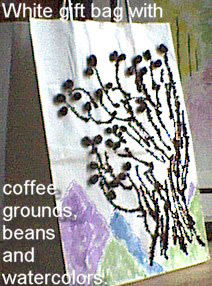 White Gift Bag with coffee grounds, beans and watercolors. To do this: draw a bush with glue and sprinkle with coffee grounds. When dry, glue coffee beans to selected branches. Paint mountains design.